Many people took advantage of the nine-day Lunar New Year holiday by taking a road trip, and one favorite holiday destination was Taitung. This year, the eastern county saw some 350,000 visitors. That's about 100,000 more compared to last year. 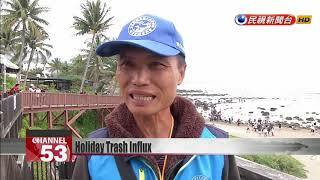 Although these tourists brought business to local vendors, they also generated large amounts of garbage. Local garbage trucks collected a massive 160 metric tons of waste yesterday, and were still unable to remove it all. Tourists from all over the country were on the beach today, trying to make the most of their final Spring Festival moments. Every coastal scenic spot in Taitung, including the Shanyuan Fish Recovery Area, has seen more than 2,000 visitors a day during the Lunar New Year holiday. We had nine consecutive days off, so you can see that the whole beach is filled with tourists. The small vendors all made a handsome profit. According to the Directorate General of Highways, more than 450,000 vehicles have poured into Taitung over the Lunar New Year holiday. Tourist numbers increased by 100,000 compared to last year. These visitors have brought with them an influx of garbage. After four days without trash pickup, locals came out early Saturday morning with their accumulated garbage. Despite stepped-up efforts, the sanitation crew was still unable to clear away all the trash. Today's garbage will likely reach 160 metric tons. That's two times the normal amount. We were on break the last few days and there were lots of tourists, leading to a rise in the volume of garbage. It's an annual ordeal. As Taiwanese get out and about over the Lunar New Year holiday, they bring long lines, heavy traffic, and piles and piles of garbage.